﻿ White door with gilded detail, behind water basin [?] in the Hermitage. White door with gilded detail, behind water basin [?] in the Hermitage. 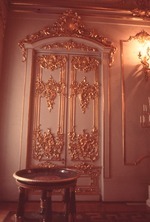 White door with gilded detail, behind water basin ? in the Hermitage.